Owning a car is something that has evolved from being a luxury to a necessity. In Singapore, this is true for some people more than others. All the same, the joy that comes with purchasing the vehicle of your dreams barely compares to anything else. Unfortunately, due to wear and tear of the movable parts, your car will not be the same powerful machine you purchased two years down the line. If you are keen on maintaining the same looks as well as performance several years after purchase, this is the time to start learning about car service and maintenance. This 3-minute article will introduce you to simple tips that will keep your ride in perfect condition. When it comes to vehicle servicing, most car owners resort to the easiest option, which is drive the car to the garage every few months. While this is an indispensable routine if you need your car to remain in good shape, there is a lot you can do on your own. The best part about learning some do-it-yourself car service and maintenance tips is that you will save significantly on service station charges. In any case, what will you do in case your battery fails away from the garage? 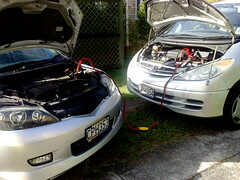 Have a look at how you can troubleshoot common car power problems. At times, the battery could malfunction due to the buildup of white sulphate on the terminals, which can be removed with a stiff brush. Another car service and maintenance tip to try is tightening up lose terminal connections. When the battery has to be replaced: Shut off your engine, open the hood and disconnect the battery. Always start with the negative (black) cable then the positive (red).Remove the clamps holding the battery in position and haul from the bottom using both hands. Replace it with the new battery and clamp the positive terminal then the negative. Before tightening the terminals, remove any sulphate buildup with a brush. Before you attempt to jumpstart the car, you need to know that trying to do so with a damaged car battery can lead to serious damages in the unfortunate event of an explosion. If the battery is broken or cracked at any part, seek car service and maintenance from your mechanic. Nevertheless, here are the steps you need to follow if you really have to jumpstart your car using power from another: Turn off the engines of both cars and position them front-to-front. Open both hoods and prop them up. Locate the negative and positive terminals of the batteries. Connect a red clamp from the jumper cables onto the positive of the flat battery as well as a black one to the negative of the live battery. Connect the remaining black clamp to a ground around the engine block, ensuring it is away from all movable parts. Then attempt to start the car with the dead battery. If it does not, start the live car’s engine for the dead battery to charge for several minutes.Try starting the car once again. If it does, disconnect the cables in reverse order. Do not be in a rush since the dead battery has to charge for a while longer before it has enough energy to crank up your engine.